Enter the operations as they appear in the problem. 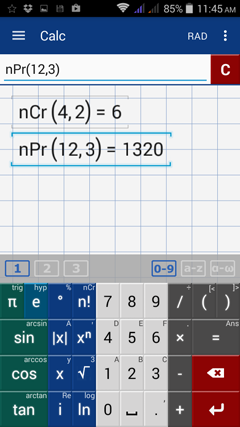 Tap the fraction bar twice if you want to use the ÷ (division) symbol. 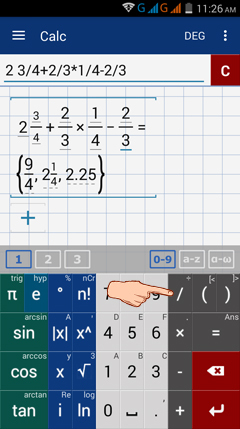 Tap the multiplication key twice if you want to use the dot symbol for multiplication. Enter the expression as it appears in the problem: 2 + 3 – 5 × 4 ÷ 6 × 3 by tapping the fraction bar twice for a division symbol ÷ and the multiplication key twice for a dot. Use the fraction bar to enter fractions, mixed numbers, and rational expressions. 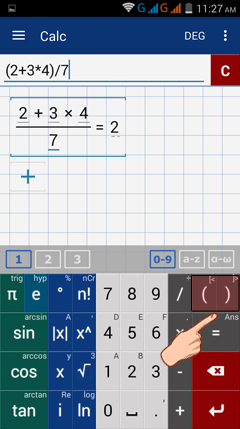 To enter mixed numbers, tap the space bar after the whole number and then input the fraction. If the number format is set to Auto, results will be displayed as a fraction or a decimal depending on the format of the entered expression. Perform the indicated operation: 2 3/4 + 2/3 × 1/4 - 2/3. To enter a negative number, use the minus sign. Perform the indicated operations: 2(–4) + (–3)( –8) ÷ (–4). Use a space bar to separate terms from an operation in an expression or to enter mixed numbers. Convert 2 ¾ into (1) an improper fraction and (2) decimal form. Enter the expression as it appears in the problem: 2 3/4 with a space bar between "2" and "3/4"
Parentheses are used to group terms together and indicate which operations should be performed first. Tap the parentheses key twice to use brackets. 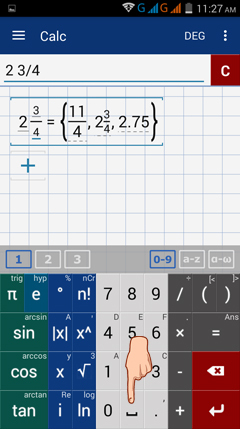 Note: square brackets are primarily used for matrices, vector entries, and variable indexes. Since the numerator in the expression involves two operations, we have to write it in parentheses before dividing by 7. 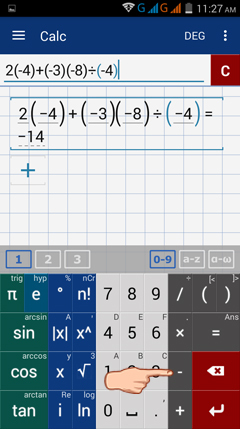 What should be added to –3x + 4 to get a sum of 3x + 5? To find the missing expression, subtract -3x + 4 from 3x + 5. Since both expressions involve two terms, we need to group each of them in parentheses. 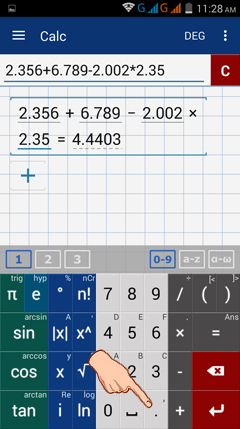 Use a decimal point to separate a whole number from its decimal part. Enter the numbers, operations and decimal points as they appear in the problem. Tap the decimal point twice to enter a comma. Commas are used to enter pairs of numbers including ordered pairs, intervals, permutations and combinations.